Natural goat milk soap differs from manufactured soaps on the market. Stop using soap with harsh, manufactured, chemicals! Instead, use a mild and gentle homemade soap, filled with fresh goats milk and natural ingredients. Goats milk has benefits for the body, skin, hair and scalp! It contains vitamins A, B, C, D, E and K! Goats milk soap is, naturally, moisturizing. It can be handcrafted in a variety of shapes and scents. Some soaps are made unscented, with no added fragrance at all. Making soap can be fun! Follow tips, procedures and soap recipes, from a master soap maker! Save time, money and energy! Goat milk soap is nourishing for the skin, hair and scalp! Get started making soap, today! 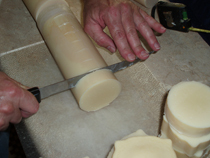 Are you looking for "hands on" soap making instructions? Earning income at home. Tips for starting home based work. Are you curious about the history of soap making? Learn more now! Making homemade soap has advanced a long way from when it began. Are interested in making homemade laundry or dish soap? Discover the Borax facts. Dr. Hulda Clark shares Borax homemade soap recipes.